TOYOTA COROLLA MATRIX CELICA MR2 / PONTIAC VIBE. 1.8L 1795cc, DOHC 16V. TIMING CHAIN KIT + WATER PUMP + OIL PUMP 1ZZFE (VVT-i). 2000 - 2005 TOYOTA COROLLA 1.8L DOHC 16V VVT-i 1ZZFE. 2003 - 2007 TOYOTA MATRIX 1.8L DOHC 16V VVT-i 1ZZFE. 2000 - 2005 TOYOTA CELICA 1.8L DOHC 16V VVT-i 1ZZFE. 2000 - 2006 TOYOTA CELICA GT 1.8L DOHC 16V VVT-i 1ZZFE (GTS WON'T FIT). 2000 - 2005 TOYOTA MR2 SPYDER 1.8L DOHC 16V VVT-i 1ZZFE. 2003 - 2008 PONTIAC VIBE 1.8L DOHC 16V VVT-i 1ZZFE. 1 Timing Chain (130 links). 1 Tensioner ratcheting - large body 1.115 O. 1 Guide Rail (left fixed rail). 1 Guide Rail (right tensioner rail). 1 Water Pump & Seal. This listing is for the "NON" high output engines. This kit does NOT fit the 1ZZFE engine WITHOUT Variable Valve Timing (VVT-i), which can be found from 1998 to 1999 model years. 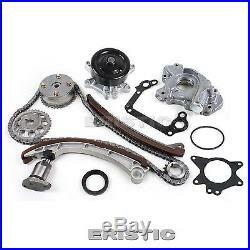 The item "00-08 Toyota 1.8L 1ZZFE Timing Chain Kit with VVT Gear + Water Pump & Oil Pump" is in sale since Wednesday, December 04, 2013. This item is in the category "eBay Motors\Parts & Accessories\Car & Truck Parts\Engines & Components\Timing Components".